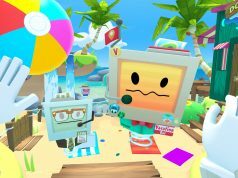 Owlchemy Labs, the developers behind the excellent Oculus Rift ready game, ‘Aaaaaaaculus!’, share their impressions of their time at Steam Dev Days and detail their experiences using Valve’s secretive virtual reality HMD prototype. If you don’t know who Owlchemy Labs are and you own an Oculus Rift, you’re missing out. The independent developers are behind one of the finest early demonstrations of VR’s gaming potential, a futuristic base jumping game called AaaaaAAaaaAAAaaAAAAaAAAAA!!! I was more than a little enthusiastic when I tried an early version of the game way back in July last year. It’s an effortless exercise in showing players what’s possible when simple concepts are mixed with VR. If you don’t own a copy and are ‘Rifted up’ you really should check it out. 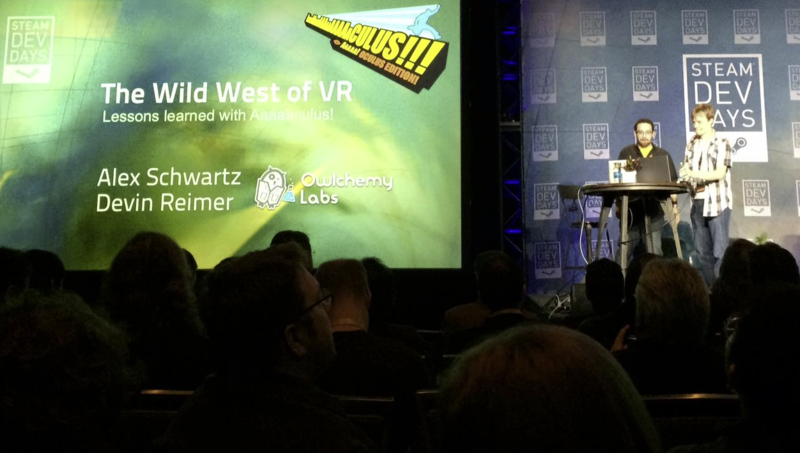 It’s clear that Valve and Oculus felt similarly as Owlchemy Labs were invited to speak at this years Steam Dev Days in Seattle. Part of the decidedly VR biased itinerary, they shared their experiences of developing for VR to fellow developers, spreading the word that VR is here and they’d better be ready. Of course, Valve’s most anticipated attraction at Steam Dev Days was a demonstration of their cutting-edge Virtual Reality HMD. By all accounts the HMD and accompanying demos were incredible and we’ve heard various developers with experience of VR speak of the feeling of ‘Presence’ representing something they’d never experienced before. We asked the guys at Owlchemy to give us both their impressions of Valve’s event and the HMD. 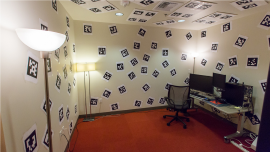 First up, Alex shares his detailed account of his time in Valve’s booth of dreams. Take it away Alex! 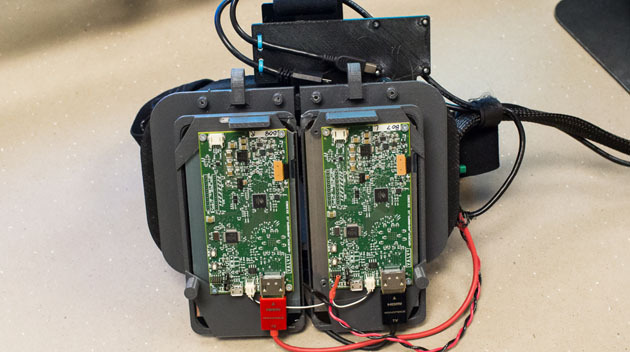 The experience of the Valve VR prototype was absolutely incredible! I was scheduled for a half hour slot to try out the headset and was led into a room. Inside of the room was a single desk and computer and a headset in the middle the room with a small square rug upon which I had to stand. The room was about 10′ x 10′ and the four walls and ceiling were covered in printouts that looked similar to QR codes on pieces of paper taped to the wall at random rotations. The markings on the wall were needed for the inside-out positional tracking technology used in this prototype, meaning the headset used a tiny camera that observed the video feed from the headset and used the visuals to determine tracking data which would tell the device what kind of head translation was done. This meant I was able to walk around the room in a small space, crouch, jump, and move freely within this small confined space. I put on the headset and the first thing I noticed was the clarity and high-resolution, as compared to the original Oculus Rift developer kit. The refresh rate was extremely fast and I felt completely at ease looking around using the headset, with no nausea. Keep in mind I had already put in a number of hours on the original Oculus rift developer kit so I am fairly acclimated to VR experiences in general, but in talking to some others who had experienced this demo, it seems that the nausea level is greatly reduced with the new low persistence screens that are being used in both this prototype and the new Crystal Cove Oculus Rift headset. From what I know, the hardware for screens has been co-developed by Oculus and Valve, with Valve having done some research to come to the conclusion that low persistence screens were a better solution for HMDs. I have no idea what the specs were but the experience felt great and it was running a very high frame rate, which made head rotation and positional movement feel exceptionally natural. Now, back to the experience. I was put through a number of demo rooms which was controlled by the operator sitting in the room with me. He would verbally guide me through the experience as he controlled which room I was experiencing. The first room had me standing in a small square room with each wall textured with a simple texture (actually, it was an outdated screenshot of a webpage like CNN.com), which was applied to each wall as a texture. From here I was switched to a new room which consisted of the same walls but I was standing on a small box high up in the air with very little room to left and right of me on which to stand, much like standing on a diving board, looking down into the pool below. I was told to walk off of the cube and it was physically difficult to step forward into the space where there was no solid footing, even though I knew that there would be a solid floor with a rug right there for me. It’s amazing how the mind can trick you. Next I was put in a simple square room with nothing but a mirror displaying a 3d representation of my own face, but shown as a white cube with eyeballs. Just being able to see my subtle head movements in this mirror and how they represented themselves in VR was absolutely incredible! The sensitivity that the headset was able to pick up was really really amazing. We went through number of rooms displaying various technical examples, with the later rooms consisting of some actual 3d game assets instead of the prototype art shown in the rooms that came before. One room had me standing near some Portal figures, of three sizes. There was one that stood near me at eye height, one that was about knee-high, and one that towered over me at about 30 feet. It was incredible how important scale played into the sensory experience of being there in the world. I was taken into a Mars Rover to look around the surface of Mars, taken outside into 3d panoramic scene that closely mirrored a frozen/paused version of real-life. I was able to observe small miniature scene with small office workers walking around, going about their day. The small scene was on the floor, at foot-level, and I was able to physically bend over and peek into the scene and observe it from all different angles. Lastly I was taken on a very trippy fly-through of a futuristic 3-D space that changed shape and ebbed and flowed as I slowly moved through it, like a magic carpet ride through a futuristic iTunes visualizer. All in all, I was extremely impressed by the tech and am dying to make some freaking VR games! It seems that this kind of positional tracking is fairly implausible in real-world situations (requiring an entire room in your house that’s plastered with strange imagery in order to play with it?) but what I’ve been seeing with the Crystal Cove’s seated positional tracking experience, things are looking pretty great for VR in the next months/year. Seems to me that Oculus could sell a second camera as an option to put behind the player for 360 degree tracking if they wanted. Just like having to buy a power cord for your cell phone… That way if you want 360 degree tracking with a treadmill you can have it at a higher price while people who are happy with the front head tracking will have that with the CV1 kit while keeping the price point lower. I agree with Chris Given. A lot of people who want to use a omnidirectional-treadmill are disappointed with the new positional tracking-system in the Oculus Rift. I don’t doubt that ideal is on Oculus VR’s radar, but they are choosing to focus on the seated VR experience which will initially be the vast majority of user’s use case. Getting the HMD out there with excellent positional tracking and not having to worry about the walkabout experience and therefore come to market much sooner. But it’s so easy just to have one more camera for full 360º positional tracking… If Oculus doesn’t give that option, there will be hacks to use a second camera the next day to the launch of the CV1. As soon as you add a 2nd camera to mount it not only changes from a casual / hobbyist product into an enthusiast’s, it also extends development, Q&A and a bunch of other things quite apart from also pushing the price up. This is IMO Oculus VR’s path of least resistance to having a consumer VR product on the shelves before Christmas 2014. And I’m really glad they’re focussing for now on just this. Makes perfect that Oculus has narrowed the focus to “seated VR”, for now…..For those who want to install a home arcade style VR experience like the Omni or Virtualizer, I’m sure there will be a solution to add another camera, or utilize the STEM system for more tracking options. There are so many variables still to be resolved with VR, including motion sickness, etc…seems like we need to sit, before we can walk, then run…. On one hand, I’m a bit like some of the above commenters in that I’d like the first serious consumer HMD to do…just about everything. It’s true that being restricted to seated VR (even though it is indeed going to be the majority of use cases) is frustrating. But on the other hand, well, VR is still in its infancy. If you want to wait for the complete VR experience, you’re going to be doing a lot of waiting. (Thinking of photorealism among other things.) For now, I’ll be more than happy with something that provides decent immersion and doesn’t make me want to puke. Oh, and, affordable. Pretty sure we could make a pretty awesome device already, but I want to BUY it. But damn, things are starting to get real. I’m just so glad to be living in our times. I could see a wall paper company selling visually pleasing wall paper with unique patterns that can be picked up by VR headsets for positional tracking. It would be a challenge but certainly not impossible to create pleasant VR-friendly wall paper. Here is an idea, you could have infrared paint that is invisible to the human eye but easy to distinguish to an IR camera. Place that on the headset and you room could look as normal as you want yet be perfect for VR positioning.